Sloanbook: Fort Fun with Family & Random Things! 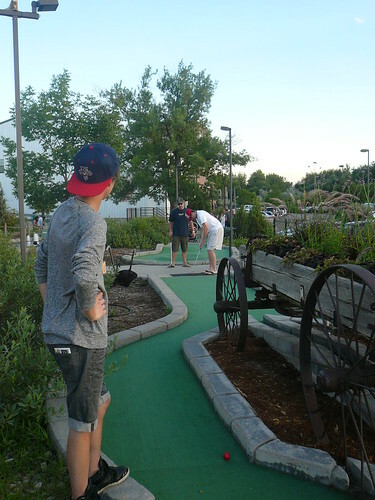 we went miniature golfing and go-carting at Fort Fun in Fort Collins. and usually I never win. Kevin has mad skills in everything. and then we decided to ride the go-carts! and I spun facing towards oncoming go-cart traffic ha. I was facing everyone and they were all heading my direction and luckily they all moved over so they didn't hit me dead on. I had to wait for an employee to come turn my car around because there was no reverse on the go-carts and they didn't want you to unbuckle and get out. Pretty much I got whiplash and it hurt for days after lol. Thanks Patrick...ha. I don't remember what else we did this day but we all just had fun at Fort Fun with the family! Today my cousin Kirra got married in the SLC temple!!! If you see me in Utah say hiiiii! PS. 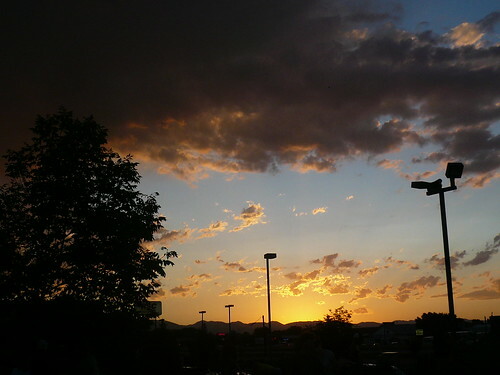 I miss Utah so much and all my friends here and BYU!!! GO COUGARS! Oh and yes, I saw Harry Potter, the last movie with my friend Emily! I love Harry Potter so much! And I really need to have a Harry Potter marathon one of these days! Someday I will get my husband to watch it with me... at least I was able to make it to the Harry Potter theme park HERE. That was amazing! 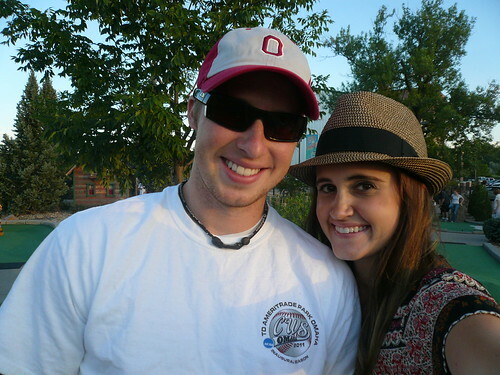 It was my sister Kelsi's birthday July 19th while she is on her mission in Sao Paulo, Brazil. She has officially been on her mission for 1/3 of the time now! I sent her some cute stationary from the boutique White Balcony in Fort Collins, some headbands, pearl earrings, a Harry Potter theme park map written in Portuguese, a Harry Potter journal, and I don't remember what else! We had a girl's night with my mom, me, & Mindy watching the Justin Bieber Movie. And I officially have Bieber fever. That kid has skills. And of course we hit up Cafe Mexicali beforehand (like Cafe Rio but in Colorado). Also, we had a girls night with Laura Neibaur and her little sister Natalie watching Tangled for the first time. We had brownies and icecream as well and talked forever. And I maybe felt like I was dating again because I drove home SUPER late at night. I don't remember driving home past 11pm in SO long. That is what I did when I was dating Kevin! I am so behind on SYTYCD. I will get caught up. And I may or may not have *almost* passed out playing tennis with Kevin after running in the morning and eating only a very small tiny bagel for lunch. It was also over 100 degrees. Yes it is dry heat and yes it was hot. It was in the middle of the day. Things started to black out so I sat down and a while later was fine. I don't recommend it though; it is never fun. So there is a lot I am skipping. Oh well, guess you can't blog everything, although I try! What are you doing this week? Anything cool?! My husband always wins too! Rob beats me at everything but I am the crazy, competitive one :) looks like a blast! YES Colorado is gorgeous! That sky is BEAUTIFUL! Silly Ashley! It couldn't have been August 23 because that has not happened yet. haha! Jk. :)But this is so fun! I love miniature golf!! I hope you are enjoying Utah! 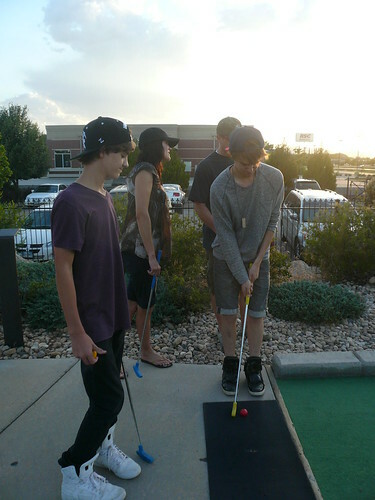 I love mini golfing- jealous you can enjoy it in beautiful CO. It is way too hot here!!!! I love SYTYCD- hope you catch up soon cause it is goooooodddd;-) I miss Colorado. I bet it is so gorgeous there this time of year! My hubby is really competitive too...they would get along! great sunset photo... and it looks like so much fun! glad you're having a great summer together. lol funny you guys watched justin bieber movie, he does have this weird charm to him that's for sure! Ashely, you sound like you're having an incredibly busy and awesome summer! I love Harry Potter too and I shall miss it. But all good things come to an end, don't they. I just got back from a mini-vacation down south and I'm now covered in paint as we're renovating some rooms in our home. oh&&i read water for elephants, i enjoyed it! i read it so i could see the movie, but i still haven't seen it..it looked good though! &&too funny about that mio water, i LOVE it. so thank you for helping them make it better :) haha i'm addicted to it. &&about trying to follow me, it didn't show up--that's happened to me before, i'm not sure why it does it, i just always have to try again and then it works!